I love re-working recipes to make them my own, with the flavours I enjoy. I reckon this one has now become my top favourite. I hope you are going to love it too. In a saucepan, melt the butter and coconut oil together over a low heat. Then add in the nut butter, cinnamon, vanilla essence and zest and give it a stir. In a bowl, add ALL the ingredients together and mix well with a wooden spoon until combined. Put mixture place into a square “brownie” tin. Allow to set in the fridge for at least one hour . Once firm remove from the fridge and cut into bar shapes. Store the bars in an airtight container in the fridge. I must just mention that these delectable morsels must be treated with the respect they deserve – they are a TREAT. Don’t let the fact that they are grain-free, with no added sugar, fool you into believing that you can munch down on 3 or 5 at a time. They do still contain calories and carbs – so go slow, savour them and make them last. Enjoy! 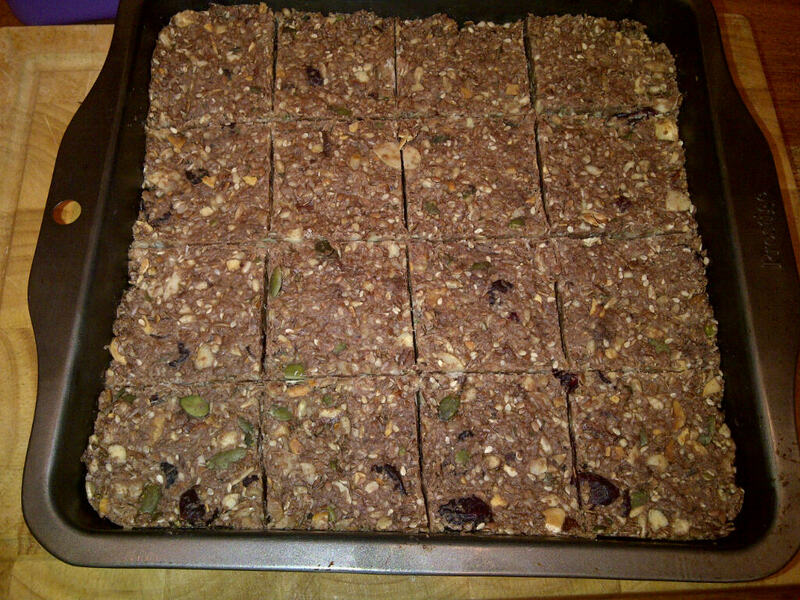 Here is a printer-friendly version of the recipe Grain -free Choc-Cranberry cereal bars. If you have lost weight and improved your health or sports performance from following a LCHF or Paleo style diet – please share your story on this blog (however brief). Go to my Success Stories page. It is a fantastic way to motivate and encourage others. 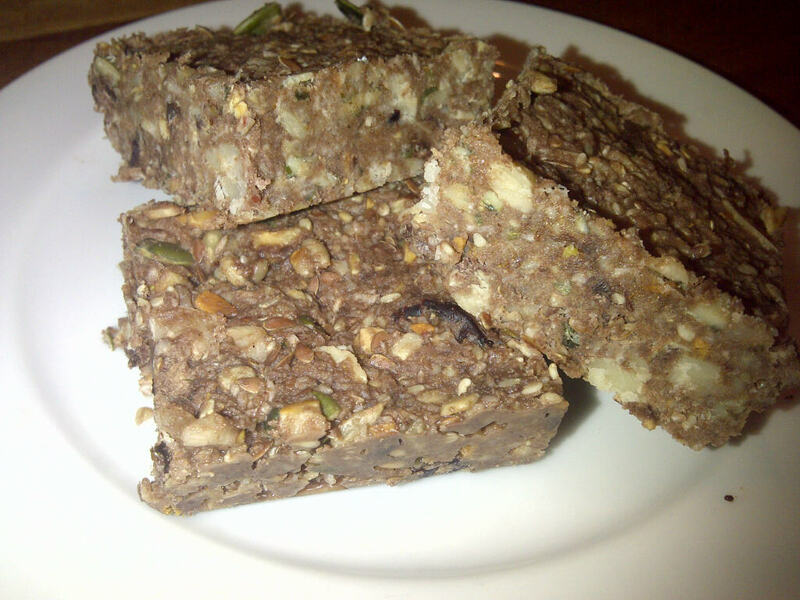 Posted on March 28, 2014, in Meal inspiration, Primal 101 and tagged Chocolate, Cranberry, grain-free cereal bar, Primal snacks, Primal treats, seed and nut bar. Bookmark the permalink. 4 Comments. Thanks Nicky this look great – I cant wait to try it. Dark chocolate – is this any type? Bournville or Lindt etc ? I’m keen to get a shortbread recipe (which is high in butter and so should be good- but to get the right flour combo is tricky). Likewise biscotti. Regarding chocolate – I suppose it depends on your budget. If trying to keep the costs down then go with Bournville, otherwise try it with 85% Lindt (which will have less sugar). hi Nicky – this looks awesome. Can you please tell me what ‘nut butter’ is – never heard of it and not sure where to start looking…. is this a health shop product, spar perhaps?! Hi Gail, you can look for almond or macadamia nut butter at health shops, Wellness Warehouse or Dischem. Otherwise just use peanut butter.